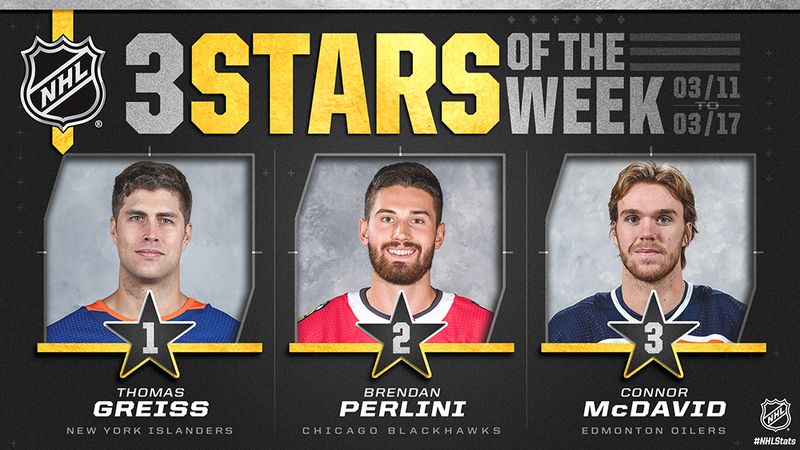 New York Islanders goaltender Thomas Greiss, Chicago Blackhawks left wing Brendan Perlini and Edmonton Oilers center Connor McDavid have been named the NHL’s “Three Stars” for the week ending March 17. Perlini shared the League lead with five goals (5-2—7 in 3 GP) to help the Blackhawks (32-30-9, 73 points) extend their overall winning streak to five games and move within five points of the final playoff spot in the Western Conference. Perlini registered his first career hat trick, doing so against his former team, in a 7-1 victory over the Arizona Coyotes March 11. He posted his second straight three-point performance with 1-2—3 in a 5-4 triumph over the Toronto Maple Leafs March 13. Perlini then added one goal in a 2-0 win against the Montreal Canadiens March 16. The 22-year-old Guildford, England, native has collected 13-7—20 in 58 total contests this season, including 11-3—14 in 36 outings since being acquired by Chicago Nov. 25. McDavid led the NHL with 3-6—9 in four games to power the Oilers (32-33-7, 71 points) to a pair of wins. He notched 1-1—2 in a 3-2 overtime victory against the New York Rangers March 11, followed by two assists in a 6-3 loss to the New Jersey Devils March 13 to reach the 100-point milestone for the third straight season. McDavid then tallied 2-1—3, highlighted by his seventh career overtime goal, in a 3-2 triumph against the Arizona Coyotes March 16. He picked up two more helpers in a 6-3 loss to the Vegas Golden Knights March 17, stretching his multi-point streak to eight contests (3-15—18). The 22-year-old Richmond Hill, Ont., native and winner of the past two Art Ross Trophies ranks second in the League with 69 assists and 105 points through 68 total games this season (36-69—105).